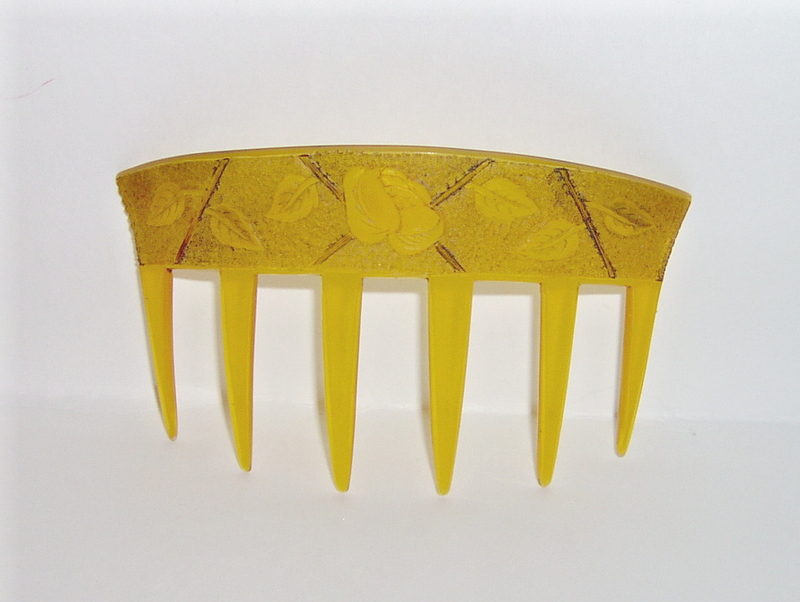 Please browse these lovely combs but remember they are vintage and one-of-a-kinds. Please them time to load. All dates are approximate. Remember you can pay with Paypal! If you haven't visited with us for awhile, please refresh your browser by clicking the right button on your mouse and choosing refresh from the menu. 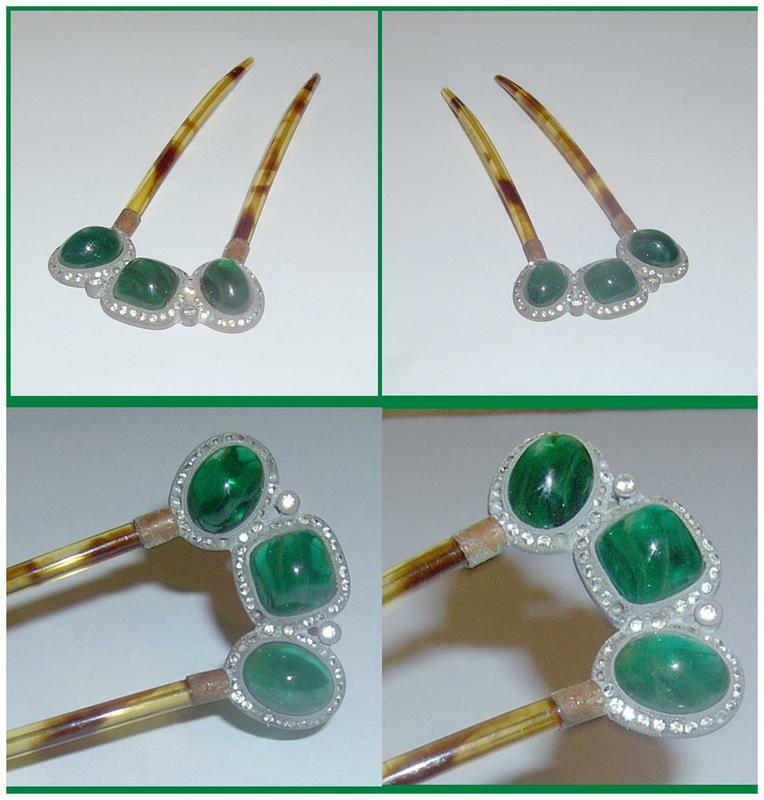 Beautiful and Best example of its kind in a blonde horn hair comb with graduated amber faceted glass balls. These are rare in such fabulous condition as this one. It measures about 4"x 3 1/2" and it's a real beauty. This is a beautiful tortoiseshell celluloid hair comb. 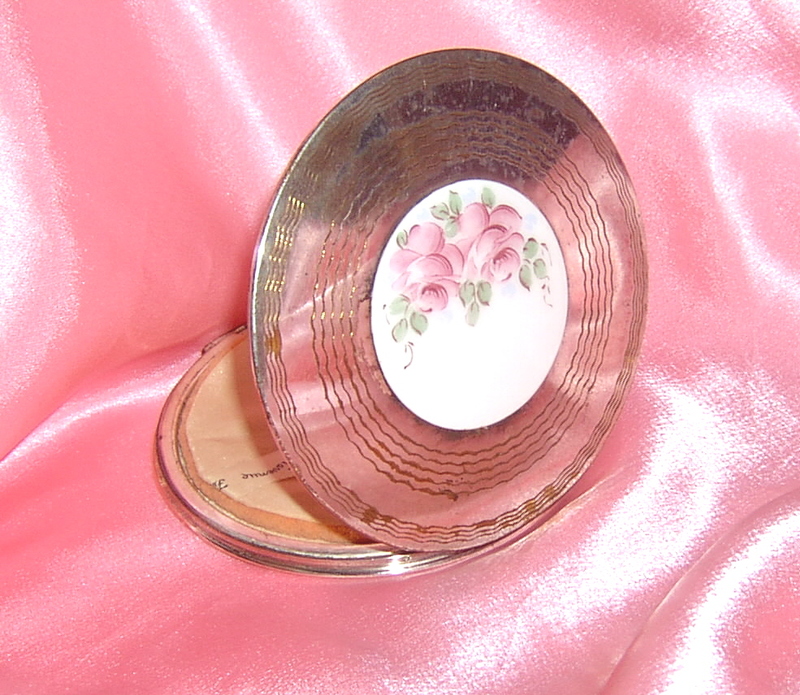 With a design of brass scroll work decorated with pink rhinestones and 2 coral roses.This back comb measures about 2 3/4” in length and 4” in width. This come is in very good condition and there is no damage to the teeth. 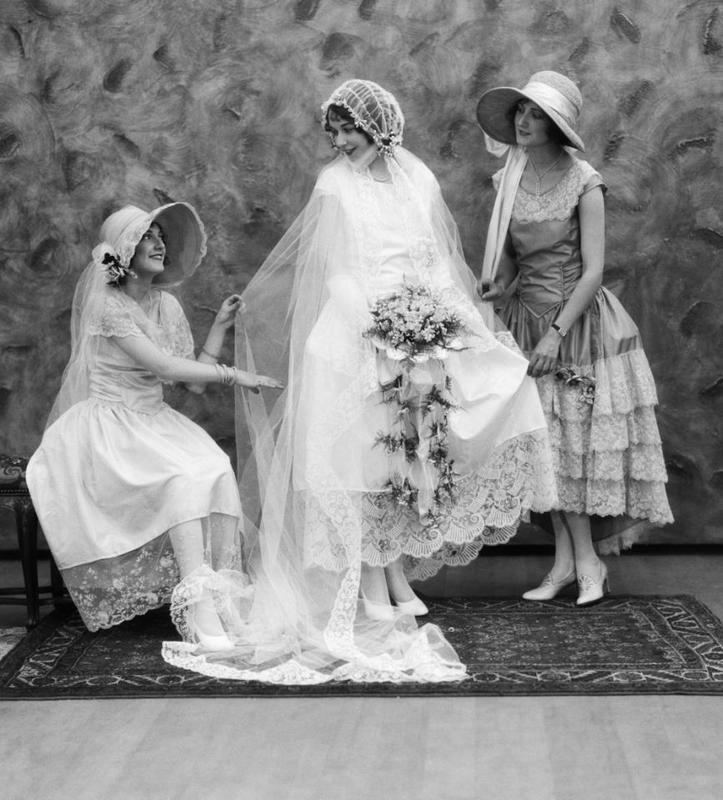 Very elegant. This is a large Black Gutta percha comb made about 1865. It is in excellent condition and measures about 4 "H x 5"L. These were made during the Civil War when most comb materials were needed for the war and it very rare because of the molded design. 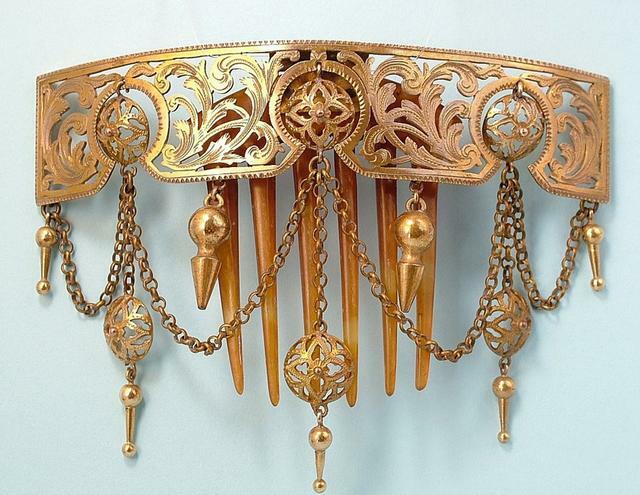 Most of thee combs tend to be rather plain and simple and this one is very ornate. 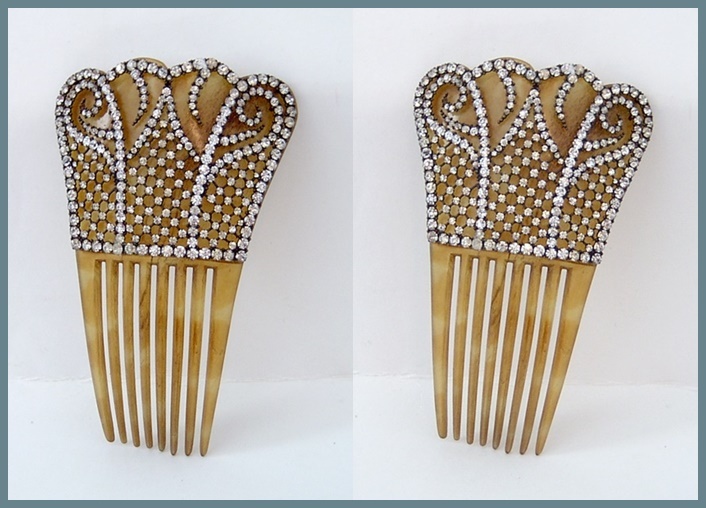 Rare Vintage horn hair comb with prong set white rhinestones. Excellent condition-no missing stones. Combs measures about 5L" x 3"W. Excepptional! 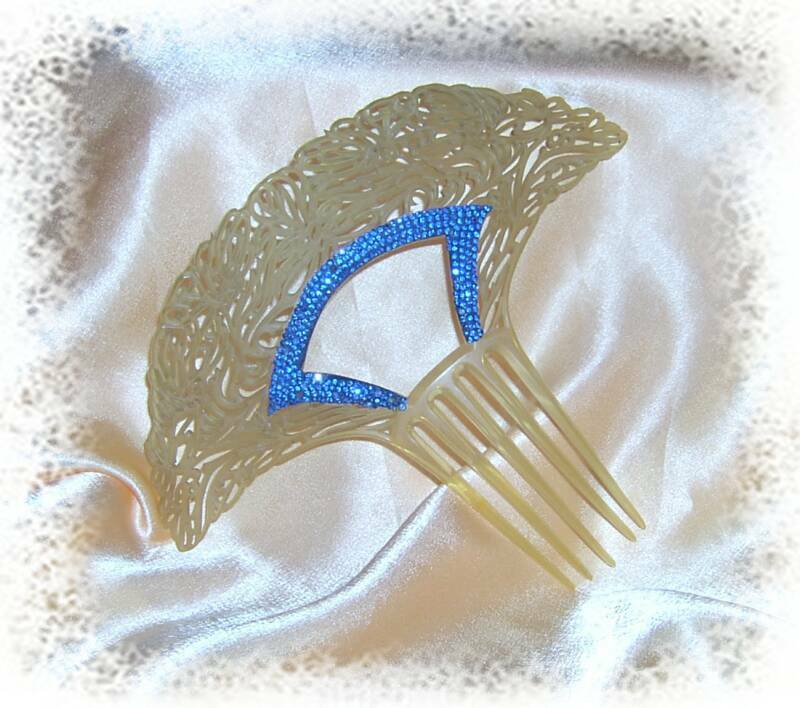 This is a unbelievable hair comb. When held to the light it is glowing! This has tortoiseshell celluloid teeth and 3 cabochon in the head surrounded by white rhinestones. It measures almost 4"L x 1 3/4" and it's in excellent condition.A stand-out! 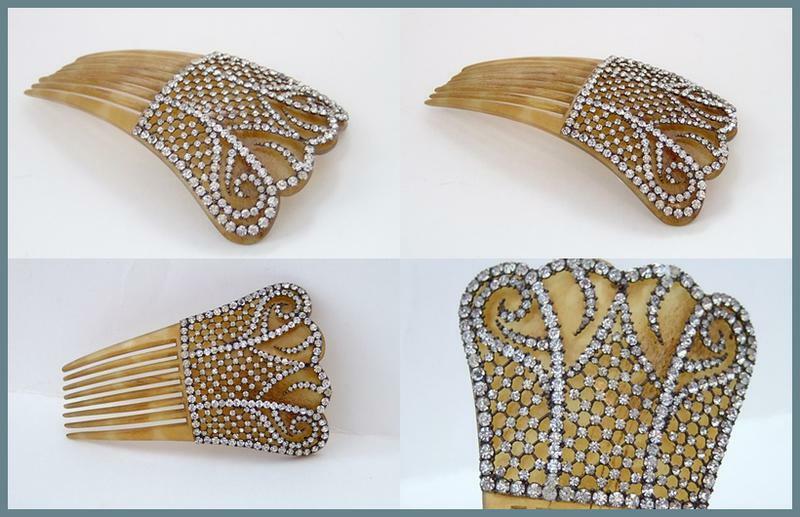 Lovely tiara style cut steel hair comb with a very fancy design and in wonderful condition for its age. There us almost no rust on this beauty . The teeth are hinged and made of horn. There is a very slight bend in one. 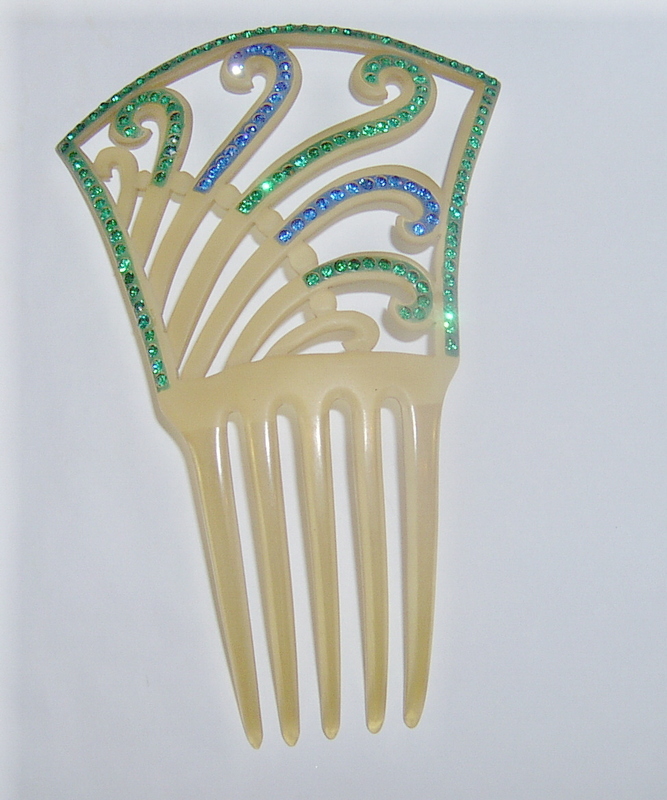 This wonderful comb is delightful and small enough to be worn today. It measures about 3 1/4"H x 3 1/4"W. !